The Origami Master is one of the best children's books I have done. The story of an unlikely friendship between two origami masters, The Origami Master is a pitch-perfect marriage of story and art. Writing a picture book is a little like writing a screenplay: there is a long road between the written word and the final product, and you can't always predict or control how things will turn out. I owe a debt of gratitude to my publisher Albert Whitman and to my wonderful illustrator Aki Sogabe. The Origami Master is collaboration at its best. lessons about life, and Aki Sogabe has artfully created a beautiful story of her own with stunning paper-cut art. The two combine to tell a truly beautiful tale." 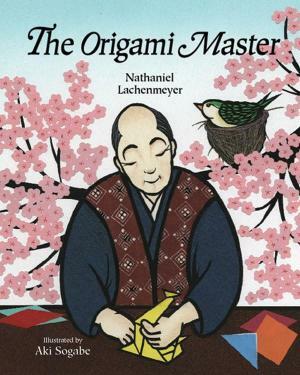 "With The Origami Master, Nathaniel Lachenmeyer and Aki Sogabe bring readers a tale as simple and elegant as origami itself. Sogabe’s art pairs bold outlines with minimal backgrounds, keeping the reader’s attention fixed on the story’s characters and their artwork. Lachenmeyer’s text is similarly sparse, with no extraneous dialogue or gimmickry to distract from the book’s plotline. Such restraint adds to the impression that The Origami Master could be mistaken for a long-forgotten gem of ancient folklore. Like those classic tales, it boasts a small cast of archetypal characters—in this case, and artist whose pride too quickly turns to jealousy and a bird whose innocent nature requires freedom. And like many of the most beloved folktales, The Origami Master brings home its moral lesson with a succession of clever plot twists. Children will particularly love The Origami Master for its bright depictions of folded-paper animals—including spiders, elephants, and dragons. Anticipating young readers’ interest in the art form, the book also provides easy-to-follow instructions for making their own origami." perfectly complement the simplicity and straightforward beauty of this story for ages 4 to 8." illustrations has the feel of woodcuts and carry well for group presentations, but lap sitters will like looking, too. Following the familiar pattern of a folktale, the restrained original story will enrich multicultural studies, encourage origami activities, and make children think." "A solid choice for discussing the importance of respecting each living creature's own space." illustrations are strikingly beautiful and truly enhance the simple yet poignant text. Another plus is that the book contains directions for creating the origami bird featured in the story!" --Elizabeth Bird, Children's librarian and blogger (A Fuse #8 Production). Copyright 2018 Nathaniel Lachenmeyer. All rights reserved.